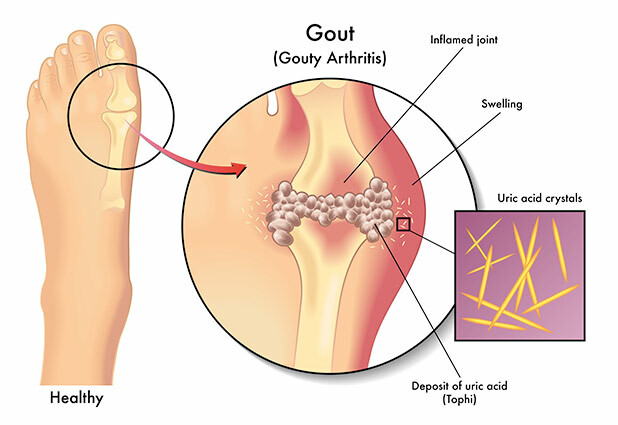 Gout is caused by small crystals forming in the joints, resulting in severe pain, tenderness and swelling. These crystals can grow when a waste product called uric acid starts to build up to high levels in the body. Uric acid is created when the body breaks down chemicals known as purines. If your kidneys don’t filter out enough uric acid, or your body is producing unusually high levels of it, it can build up in the body and turn into microscopic crystals. These crystals usually form in and around the joints, possibly because the temperature in these areas is slightly lower than the rest of the body. If they get into the space between joints, the crystals can cause painful inflammation (redness and swelling). A high level of uric acid in the blood is the main factor that increases your risk of developing gout. However, it’s still uncertain why some people with a high level of uric acid in the blood develop gout, while others with an equally high level don’t. Uric acid is created when the body breaks down purines. Eating foods that contain a high level of purines can increase your risk of gout. Beer, fortified wines like port, and spirits do this more than wine. Moderate consumption of wine – one or two glasses a day – shouldn’t significantly increase your risk of gout. Certain sugary drinks may also increase your risk of gout. Some research has found that drinking sugar-sweetened soft drinks and drinks with high levels of fructose (a naturally occurring sugar found in many fruits) had an increased risk of gout.